Disused plastic bags, chicken wire and string, 50x50x50cm(aprox), 2013. 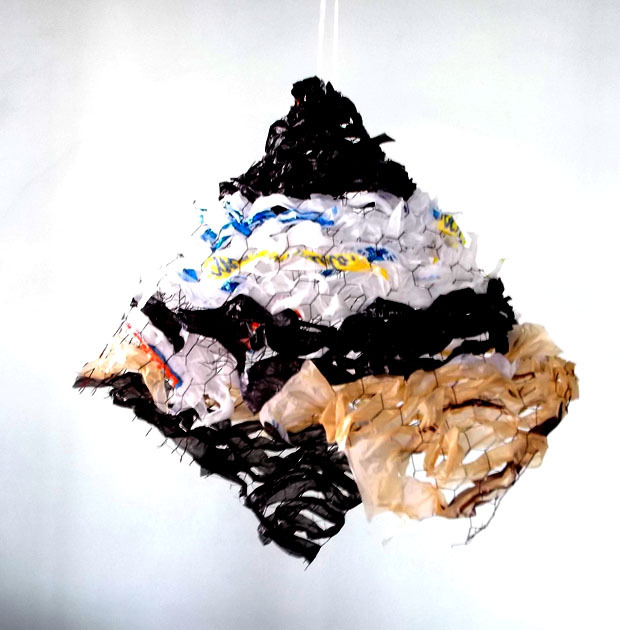 Disused plastic bags, wire, tape and string, 40x30x30cm(aprox), 2013. Pencil and pen on paper, 21 x 29, 2013. Disused plastic bags, chicken wire and string, (detail), 50x50x50cm(aprox), 2013. Detail, various Bloom mobiles installed at the Kiosko outside mARTadero centre, Cochabamba, Bolivia, as part of En Red Arte Sin Nada, 2013. Various Bloom mobiles installed at the Kiosko outside mARTadero centre, Cochabamba, Bolivia, as part of En Red Arte Sin Nada, 2013. The Blooms form mARTadero have been combined to make one since dense piece, 40x40x40cm(aprox), 2013. Detail, the Blooms form mARTadero have been combined to make one since dense piece, 40x40x40cm(aprox), 2013. Chicken wire, disused plastic bags and string are woven together to make larger blooms that still have the ability to move and dance freely in the breeze. 50x70x60(aprox), Santa Cruz de La Sierra, Bolivia, 2013. (Reflection), Chicken wire, disused plastic bags and string are woven together to make larger blooms that still have the ability to move and dance freely in the breeze. 50x70x60(aprox), Santa Cruz de La Sierra, Bolivia, 2013. Chicken wire, disused plastic bags and string are woven together to make larger blooms that still have the ability to move and dance freely in the breeze. 50x70x60(aprox), El Mercado del Progresso (next to La Troje art centre), Cochabamba, Bolivia, 2013. (Installation), chicken wire, disused plastic bags and string are woven together to make larger blooms that still have the ability to move and dance freely in the breeze. 50x70x60(aprox), El Mercado del Progresso (next to La Troje art centre), Cochabamba, Bolivia, 2013. Detail, woven sheet of chicken wire and disused plastic bags, 100x17x1cm (aprox), 2013.